Spinning | The Messy Palette . . .
Now and then I get the above question—always in response to that rare effort with which I’m really happy. Some of my paintings are okay (no more than that), and some are (in my opinion) frame-able. But occasionally (once in a red moon?) something happens that actually delights my heart. Like this one which I have titled “Recalling Argyll”. What I do know is that I nearly pitched the thing in my wastebasket. It went through several yucky stages, compounded by the fact that I had nothing whatsoever in my mind when I began painting. Often that works beautifully, especially with transparent watercolors on YUPO paper which happily does its own thing and produces surprising results when you keep your paintbrush in check or use it lightly. But in the above case, the transparency got buried too quickly in layers of gouache. Gouache is my ever-ready friend, but here I let it get overly friendly. 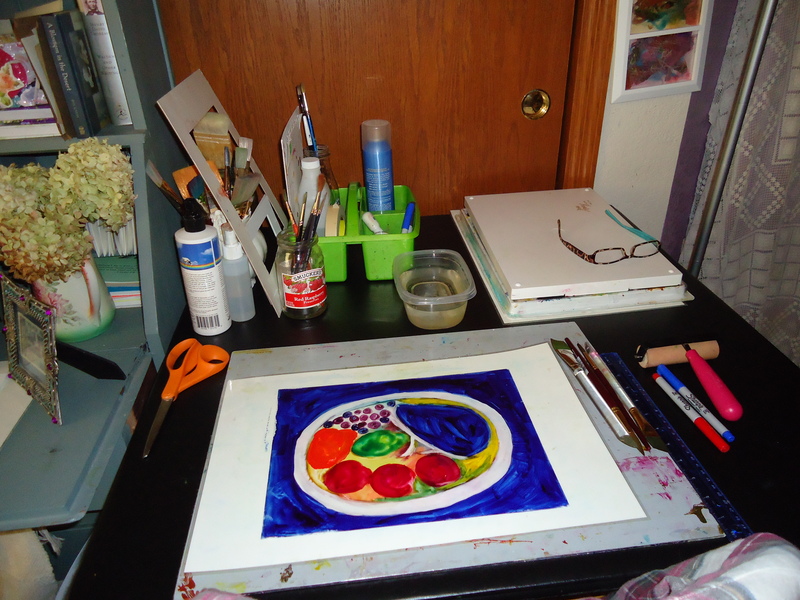 In lieu of simply pitching the work, I decided to just let it alone so the mess of gouache could dry properly—no easy task in our famous Southeastern Wisconsin summer humidity. Several days later, I revisited the mess and gave it one last fling—this time globs of white gouache blotched randomly to cover up the muddiest layers of the original paint. And instantly the scene popped out at me: Argyll. Back in 1993, Joe and I rented a car and drove (actually Joe did all the driving since it was on “the other side of the road”) 2200 miles–mostly on back roads in Scotland, England, and Wales. I was raising sheep here in Wisconsin at the time, for wool for my hand spinning and because I love animals—even the silliest of varieties. So we had planned ahead to stay at sheep farms on this trip of a lifetime. We landed at Glasgow, and spent our first two days and nights on a farm in Argyll—a familiar household name in my childhood home. My Grandma Kate was a Campbell* and pointed proudly back to some 11th century Duke of Argyll. But maybe Argyll popped up because in 1993 I felt a deep down sense of belonging there, either due to the 11th century Duke or simply because Argyll is a poignantly beautiful part of the world. *If you read Scottish history, you will discover that the Campbells behaved atrociously to the Mac Donalds—something I would hope will stay buried in the past. Anyway, here is my peaceful finale: They came to the USA, where the Campbells made soup and the Mac Donalds made hamburgers. Additional passions–scarves and shawls: and MORE! Scarves and shawls, plus capes and sweaters, fulfill as much of my creative energy as do paints. Above are samples of pure silk blanks (available online via Dharma Co., CA) painted with Sharpies fine (brush tip are great) permanent markers (not the oil base ones). This is too much fun. Just color/color/color the scarf to your heart’s content, and when satisfied spray (saturate) with rubbing alcohol. Allow to dry, then press with a hot steam iron. These recently sold well at a pre-holiday fair. Everyone loves them. The selection of blanks is great—Dharma even has dancing veils. Here Pinkie is happily modeling the world famous Potato Chip Scarf–so named 1) because it curls and 2) because you can’t just make one. They are as addictive as the edible, salty variety. And below we have Pinkie again, cowling it up. Knitted, of course. I go on yarn surges. A few years ago, it was Debbie Bliss’s Baby Cashmerino. Then Cascade 220. Then Cascade Sunseeker. Now it is Malabrigo Silky Merino: 49% silk and 51% merino wool. All are wonderful. 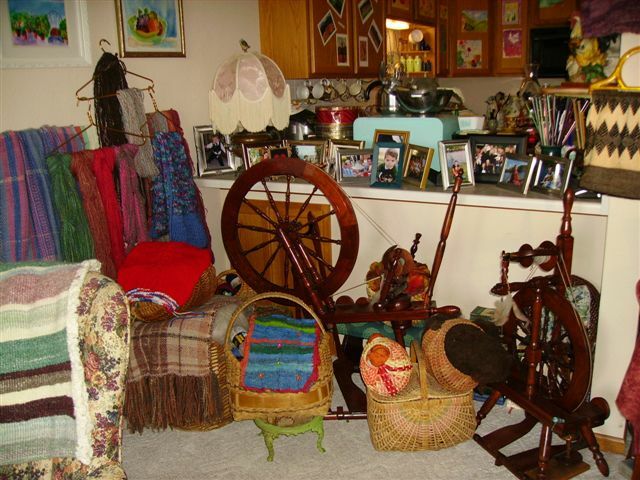 All are unabashedly overflowing and falling out of countless baskets, many of which I have made in former years of “also passions”. Finally, spinning. The basket filled with color contains wool roving, and the white fiber in the pink basket is silk. Two excellent Jensen wheels, Wisconsin made, grace our living room and in this case one of them is (characteristically in seasonable weeks) working on our patio. What a joy to make yarn, and knit it. I still have a lot of gorgeous deep brown Shetland from my last two silly sheep, in the late 1990s. Coming SOON! I can hardly wait. How about you? While I agree that financial resources are necessary to pursue any of the arts—at least to provide the basics for living and supplies for one’s craft—I disagree with Virginia Woolf on the matter of “a room of her own”. 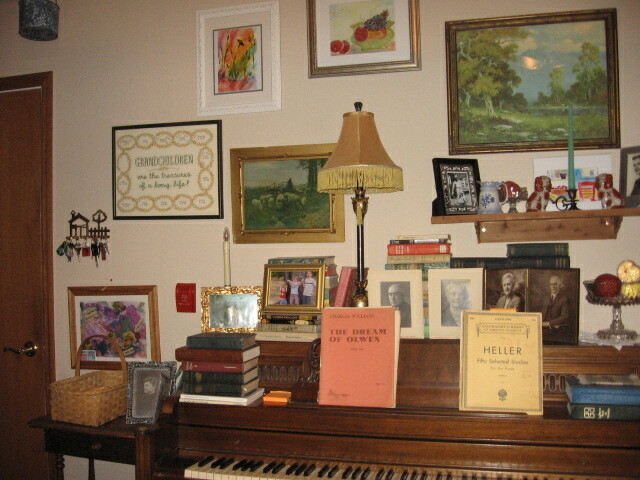 For many years I wrote (some fiction, and a lot of everything else) in various places around the home—starting with a kitchen corner counter where I sat on a stool and wrote for 2 hours most every afternoon while dinner simmered or baked, and our small children tumbled and bumbled around me. From the kitchen, I graduated to a writing desk in the corner of our master bedroom. Then came some interim years where I did have a spare hobby room in the home, and now I’ve happily returned to a desk in the master bedroom. In this same bedroom we have a generous window sill and table for houseplants, and 2 work surfaces where I can paint and build collages. A second desk with shelves and drawers holds painting supplies, along with 3 commodious stacking units of plastic drawers from HOME DEPOT. A room of one’s own can be a few square feet in most any multi purpose room. Private space can be managed most anywhere, when we enjoy planning and accommodating our working needs to whatever is available. It’s amazing how much furniture (and how many objects!) can be efficiently and attractively crammed into a given area, when one is willing (and in my case, eager) to be creative and somewhat “far out”. I’ve always loved arranging my home in ways that would make most conventional “interior decorating” gurus shudder—just as I thrive on decorating with stuff that the conventional folks would take to the dump, or toss out to the curb. The main challenge with private space is to create an area where projects may be left out while in process. The drawback of working at a kitchen counter or dining room table is obvious; the writer or artist must clean up his or her act in order to prepare and serve a meal. One artist said she was happy to finally move her art space out of the kitchen, because she was tired of getting peanut butter on her brushes. I subscribe to art magazines and enjoy gazing at the spacious studios where professional artists work. But I simply do not covet these studios one teeny bit. The professional artist who hangs his work in galleries frequently does large renderings. Gallery displays— especially of oil paintings but also of acrylics, water media, and collages—tend to measure out in feet rather than inches. At this point, I have not been motivated to “work big”. My largest pieces are 11″ x 14″, matted and mounted in 12″ x 16″ frames. 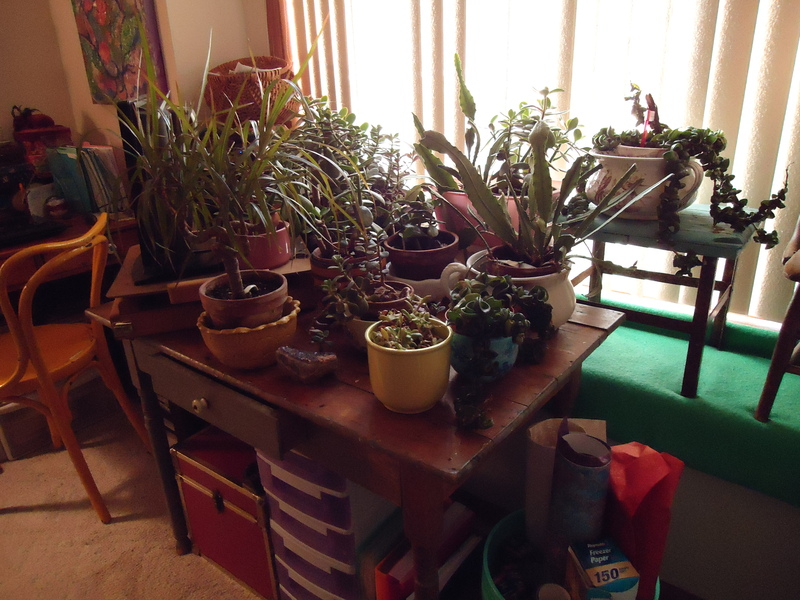 The above pictured card table could accommodate a larger support, and will—if I ever decide to expand my paintings. I’d simply have to move my palette and brushes somewhere else for the duration. Meanwhile, smaller works are fun! Joe’s den is his “sports viewing studio”, and it is his computer area as well. There 2 things on earth which Joe and I cannot share: 1) a toothbrush and 2) a computer. Joe and I each have our own cyberspace. He has a recliner chair in his den, so it’s also a “napping studio”. Hands that spin, weave, knit, and make soap . . . . 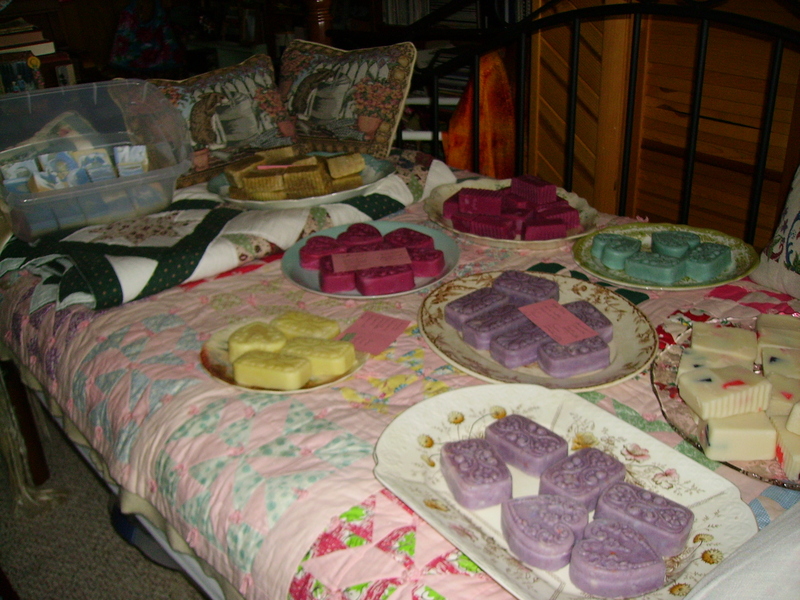 I love to show off my beautiful homemade complexion soap. The soap is everywhere, in antique bowls, on platters, and stacked on shelves throughout our home. Our daughter Laura, daughter-in-law Cheri, and I are producing heart soaps for Cheri and Eric’s daughter Nicole’s August 7th wedding. The soaps will be wrapped in pretty net bags, and placed at each plate for the reception which is to be held at Whitnall Park Botanical Gardens in Milwaukee. Homemade! There is nothing better! We live in an age of communication via words–and quite frankly sometimes I’ve had words up to my eyeballs! Literary words, as in classic poetry and novels, YES! I can’t get enough of those words. But today’s words–text messaged, emailed, and even blogged like my words–get old fast. How refreshing to be still and make things with one’s hands. I believe I could survive without talking (although some might doubt that!) but I know I’d go bonkers if I couldn’t make things with my hands. At a ladies’ luncheon party this week, we talked about how–when we were brides back in the 1950s–we embroidered our kitchen towels. These bits of memory make my heart sing. Now despite all that is wrong with our culture, the magazine racks tell me something is right! There’s a plethora of periodicals available on the subjects of knitting, crocheting, scrap-booking, quilting, beading, cooking, gardening, home decorating, etc. I am not the only one on this planet who derives sustenance and life energy from making things. The desire to create with our hands is part of our birthright, for we are made in the image of a creative God. Whereas He created Heaven and earth out of nothing, we make things out of materials already made. Yet the desire to create is evidence of God’s imprint on our lives. Pictured below is our grandson Joelly, who cannot “play it straight” for a photo shoot. (I love his silly faces!) 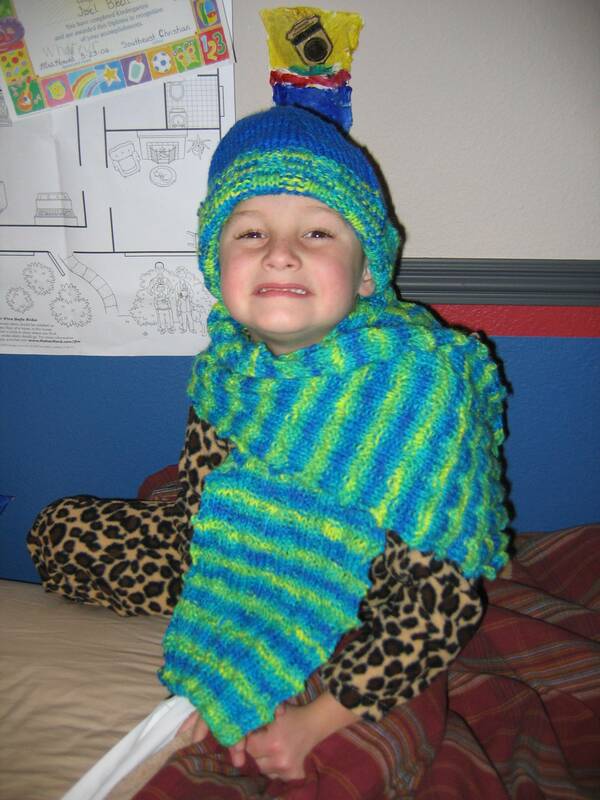 🙂 Joelly is wearing a scarf and hat ensemble which I made him for Christmas a few years back. Hands that knit, and weave, and spin, and make soap (and many other venerable home products) are happy hands!